Japanese Prime Minister Shinzo Abe tried to get confirmation today at the G7 conference in Canada if British Prime Minister Theresa May or German Chancellor Angela Merkel would be serving refreshments. “It can only be one of two options,” Abe said to US President Donald Trump. Abe told Trump in Japan the women do the pouring. 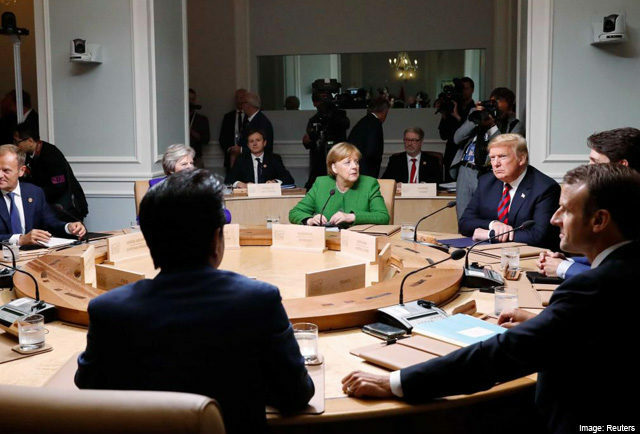 “That’s so amazing – tremendous,” Trump tweeted to Abe from across the round table. “We need crooked Hillary,” Trump added in a follow-up Tweet. Abe was later shocked to discover men had to do their own pouring. Trump told Abe the West still had a lot to learn.